This Vertical Diamond Bar Ring from Elizabeth & James is the coolest thing I have seen in a while. Those Olsen twins sure have managed to impress me with their fashion businesses. Who knew they could go from Full House to serious business women and designers in the fashion industry. 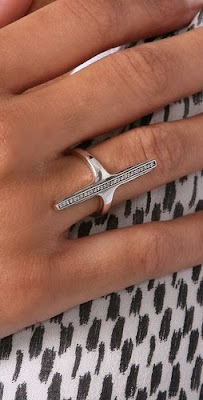 I love this ring because is very edgy yet understated at the same time. It won't overwhelm your look but add a little excitement to it. 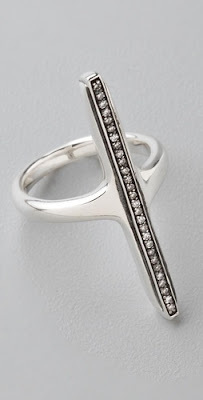 I love rings like this that make statements, and who doesn't love a few diamonds? oooh, it looks really cool! i was a little apprehensive of the photo of the ring by itself, but on your hand it looks gorgeous! I love it... unique style and just so fabulous. cool, though i think i'll probably wait for the F21 knockoff. E&J does make some pretty covetable jewelry.